Admiral's Cove is Lakeshore's newest waterfront development project, located in the Lighthouse Cove area. This is a two-phase project, with Phase 1 featuring 22 waterfront lots on deep water canals, and most lots being 100 ft. wide and 150 ft. deep. These canals lead to Lake St. Clair, which is only a three minute boat ride away along a scenic route. These deep canals allow for boats of almost any size to easily reach the lake so you can truly take advantage of the waterfront location of these outstanding new home builds. 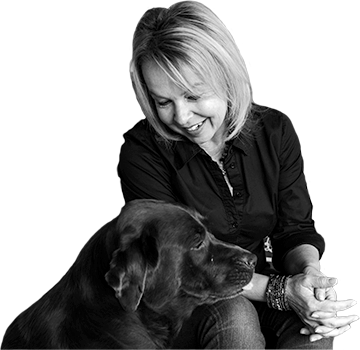 New homes in Phase 1 start at $450,000, with an average price range between $530,000 and $700,000. These homes are being built by Azar Homes and Depencier Builders, two of the most trusted names in New Home Construction in Windsor-Essex. To learn more about the location of the new home builds included in Phase 1, as well as which lots are still available, click the link below. Phase 2 will include twenty-two additional lots, with price ranges and more information coming soon. To Learn more about the models of homes available in Admiral's Cove in the Lighthouse Cove area, click the links below. The first of the outstanding custom homes available in Lighthouse Cove's new development: Admiral’s Cove, offers you 1676 square feet with custom stone & hardie plank lap siding, all glass along the waterside to give you a stunning view, 3 bedrooms, 2.5 baths, master bedroom with ensuite and walk-in closet and so much more. This outstanding custom development in Lakeshore’s newest waterfront development is a custom 1524 square foot ranch finished with custom stone and hardie plank lap siding, offering 3 bedrooms and 2 baths, gleaming hardwoods and granites inside, 18 ft. ceilings, and much more, all sitting on a deep waterfront lot that leads right to Lake St. Clair. Learn more about Admiral's Cove, including details about the lots, pricing, features, builders, and much more. 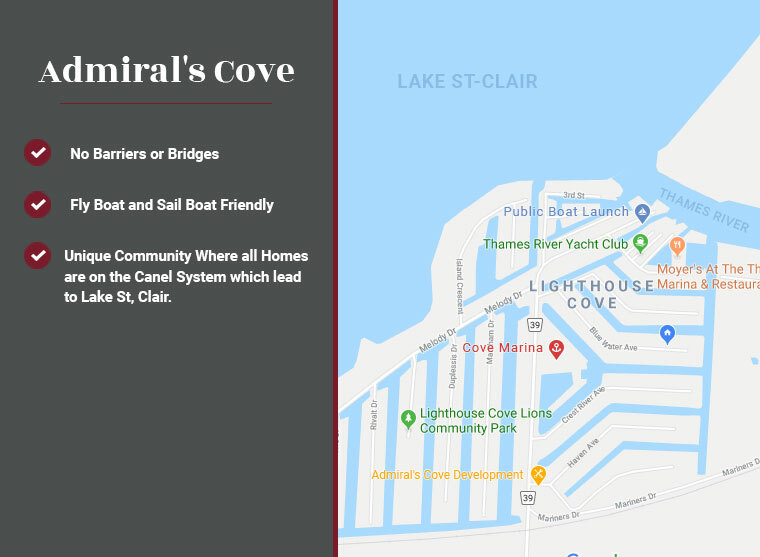 Admiral's Cove is located in the Lighthouse Cove area in Lakeshore, Ontario, a scenic town of just over 34,000 people bordering Kingsville, Leamington, Essex, and Tecumseh, and close to Windsor, Ontario. The new homes available in Admiral's Cove place you within thirty minutes of Windsor, sixty minutes from London, and two hours from Kitchener while giving you easy access to the water in a scenic, desirable neighbourhood.